This page was last updated 21 August 2018. 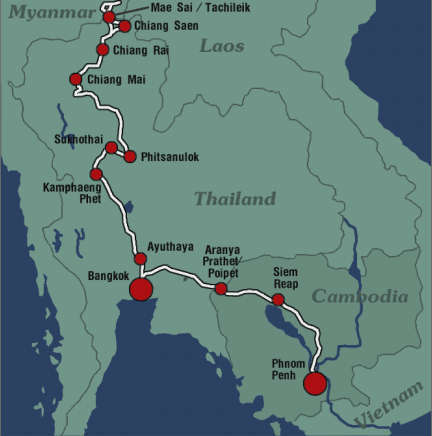 See also my 1998 tour to Thailand. We arrived in Phnom Penh at around 20:00. Immigration for western Europeans is trivial, all it takes is a passport-sized photograph and US$ 20. The weather is hot and humid. Just stepping out of the arrival building was enough, and taxi drivers offering transportation to downtown descended on us. Within seconds we were on our way to the Renakse Hotel, a special recommendation by the Lonely Planet guidebook. The taxi cost US$ 7. Yes, Cambodia's currency is primarily the US dollar; their own, the riel, is only used for small change. One dollar is about 4000 riel. The Renakse hotel is old, with simple but nice rooms with fan and air conditioning. It's right across from the palace, and two blocks from the river. Traffic consists of more motorcycles than cars, all moving very slowly but randomly cutting across lanes. Every few minutes a "moto" rider would stop and offer a ride; few people seem to use taxis. On our first night we tried to reach the river but to the south, access is blocked by several very large hotels, the kind that package tourists favor, until we found ourselves in a large bustling market with lots of food stalls, entertainment, and barefoot children. We spent all day walking about the city. 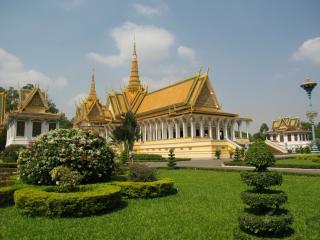 The first visit was to the royal palace, right across the street from the hotel. Not all of the compound is open to the public, and there are guards to shout at you when you come too close to the forbidden areas. 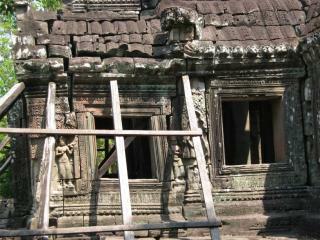 There are many grand buildings in the Khmer style, with staggered curved roofs. The throne hall, shown to the left, is the largest, but the most impressive is the silver pagoda, which gets its name from the 50,000 silver tiles on the floor. Most are covered with carpets. There is also a huge mural covering parts of the outer wall showing the history of the Khmer kingdom. There are palm trees and countless flower pots everywhere. We then followed the route recommended by the Lonely Planet guidebook. The highlights were not the monuments and builings, but the markets and the people. Psar Thmey, the old market building with its huge central dome, is worth a visit, but there isn't much to see to the north of it. 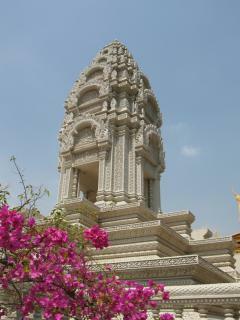 Except the small temple and stupa on Phnom Penh's only hill, near the river. It's a pleasant little park, and we scaled its full height of 17 meters. A great place to rest after a day of walking. There is also a small open market, where I ate excellent fried noodles with beef. A small half-naked boy who looked like for years old started begging very insistently, then happily scurried off with the bananas we gave him. We walked along the river back to the hotel. The riverfront road is very busy, and more oriented towards tourism than locals. (The rest of the town is blissfully original and free of tourist traps.) We found a travel agent and booked a bus ride to Siem Reap the next morning. We should have done that earlier, our first choice was already full. We had dinner at the Friends restaurant close to the national museum. This is an amazing restaurant - spotlessly clean, with art on the walls, attentive waiters, and a pleasant terrace. The food was excellent, I never tried a better chicken curry, and the fish with salsa verde was excellent. You could transplant the place to hip Berlin Mitte and it would be a huge success - except you'd have one third of the staff and triple' prices. Highly recommended! Phnom Penh traffic consists mostly of motorcycles, and a few bicycles and cars. All weave in an out of traffic with reckless abandon, but at low speeds. People don't make turns here, they plunge into oncoming traffic. We took the bus to Siem Reap, which barrels through the same streets at a much higher speed, leaning on the horn all the time. Honking means, if you are not on the shoulder at the count of three, whatever happens is your fault. The road is filled with the ubiquitous motorcycles, bicycles, carts pulled by horses or oxen. I have seen motorcycles so overloaded with wicker baskets that the rider was visible only through a gap in the front; minivans completely packed with people both inside and on the roof, with legs dangling down the windshield, motorcycles with five people on them, strange two-wheeled trailers with a single-wheel miniature farm engine attached in front with a long pole, like an inverted long-tail boat, and unattended cattle parking in the middle of the road. The bus stops halfway to Siem Reap for half an hour. Rather than following the others into the "suggested" restaurant, we walked about town. As always, there was an extended farmer's market with fruit and dried fish and undefinable other foods (see picture to the left), but this place was clearly far poorer than we had seen before. The stalls consisted of tarps for shadow, with people sitting on the ground, preparing food around them. One feels like an alien walking among those people. Children came to the bus trying to sell fruit, eggs, and pale yellow liquids from plastic bags with a straw. The pineapple was rather good. Since we had prebooked our hotel, the Golden Orange Hotel, they picked us up at the bus stop in Siem Reap. The hotel is new, very nice, they speak English and German there, and it's cheap at $20, although a kilometer from the center of town. We walked there, and had a late lunch at the excellent Khmer Kitchen restaurant near one end of The Alley. Their version of the national dish, aptly named "Amok" in Cambodian, was fantastic. The city is unremarkable except that it is evidently very affluent and flush with foreign investment capital. Landscaping, architecture, and shopping is clearly aiming at western tourists. Then it was off to the temples. 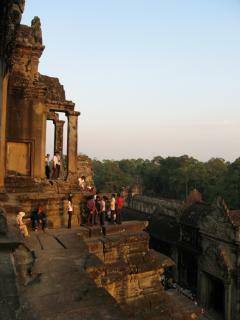 Angkor Wat is the most famous complex of the many temples of Angkor, the old capital of the Khmer empire. Together they are a world heritage site, and the temples are breathtaking, unlike anything I have seen before (and I get around a lot - it's more than on par with Tikkal and Karnak). When you buy your tickets at 17:00 for the following day, you still have one hour on the same day, so we just had time to climb the main temple of Angkor Wat. Angkor Wat is a walled square with a kind of very steep pyramid in the center, which is crowned by four large stupas in the corners and one larger central stupa, in the sugar-cone shaped Khmer style. The teaser image at the top of this page shows the approach to Angkor Wat. The temple is so large that people appear about three pixels tall. The two pictures above show the central temple. The whole structure is very intricately carved from sandstone. It was in constant operation as a Hindu and Buddhist monastery since it was built in the 12th century. The evening sun cast it in a soft orange glow. Try to see the main temple around 17:00 because the setting sun will illuminate it as you approach it, an unforgettable experience. We went back to the temples at six o'clock the next morning, to catch the sunrise. We had hired a driver for the whole day, for $12. Our first visit was to the Bayon, which is part of Angkor Thom, a much larger but less well preserved complex than Angkor Wat. The Bayon looks like a big pile of rubble from a distance, but is a large collection of stupas with many reliefs and large sculpted faces that give it a very special character. There are also lots of hallways and rooms underneath. The Angkor Thom complex also contains other nearby temples, such as the impressive Baphuon temple. It's currently being restored and inaccessible, but there is a very long raised walkway leading up to it that rests on countless low columns. (I can just see the king marching through a home builder emporium, telling a clerk to pack "...1000 of these little columns".) Next is a small well-preserved but closed pyramid temple called Phimeanakas, and a long raised path adorned with sculptures and elephants on the side that leads to a large relief gallery at the terrace of the leper king. 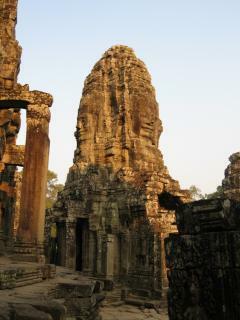 But the highlight of Angkor Thom is the Bayon. 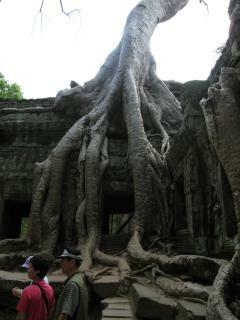 Our next stop was Ta Prohm. 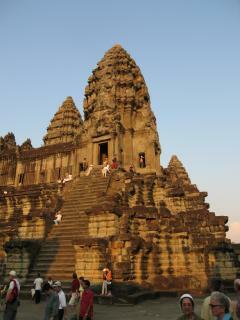 If you have seen pictures of Angkor, most were made here. 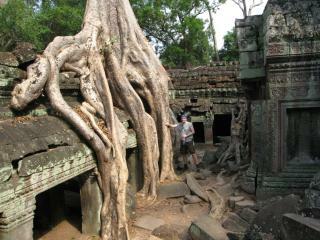 While the other temples were largely cleared of vegetation, Ta Prohm is unrestored. Giant root systems of large trees seem to strangle the walls and buildings of Ta Prohm, like alien tentacles attacking the walls and buildings. The picture above right and below left were taken there. Besides the grandeur of the Angkor Wat towers, and the gracefulness of the Bayon faces, this is one of the most impressive sights of Angkor. The director of the Tomb Raider movie must have thought so too - the movie was set here, as the guides offering their services won't stop reminding you. Speaking of touts - there are little shopping huts and tents all over Angkor, so cold water, soft drinks, and T-shirts are never far. Walking past a strip mall like that is like running a gauntlet - everyone is shouting and offering their wares, holding up T-shirts or scarves. Worst of all are the small children trying to sell postcards, guide books, or small buddha statues. They can't be much older than six years. They must have practiced looking adorable and forlorn. Only the smallest simply ask for "boom boom", meaning bonbons, or sugar candy. I wish I had brought some. We saw more temples after Ta Prohm, but, as the Lonely Planet puts it, we were kind of "templed out" and not as discriminating as before. Another temple, another relief, another buddha... It all blurs together after a while. We did have a very good lunch (there seems to be no bad or mediocre food in Cambodia) at a restaurant suggested by our driver. Usually there is a commission involved in such recommendations, but the food was good and not very expensive. I have no name but coordinates: N 13"25.979' E 103"54.304', and it's not easy to recognize as a restaurant from the outside. After booking a bus to Poipet on the Thai border, we went to the floating village of Chong Kneas. The tuk-tuk ride went smooth at first, but for the last 3.6km the road become a rocky and potholed dirt path. The driver's motorcycle has suspension but the cabin where we sat does not, so we were bouncing around wildly. 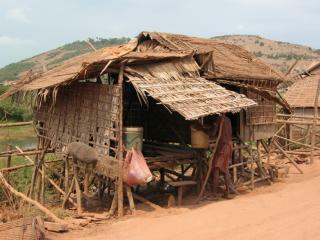 As we were leaving Siem Reap, the houses were markedly less fancy than downtown. Then stone houses turned to wooden houses. Then there were only ramshackle huts constructed from bamboo poles, woven palm leaves for walls, and thatched roofs, as in the left picture below. Occasionally someone managed to afford some corrugated metal, or a tarp. Many houses were on stilts, very long ones where the huts were built over the river bank. I could often peek inside through the small doors, and see small children sitting around their mother. There is true poverty here. And between all those huts, a constant flow of buses and tuk-tuks carry rich western tourists to the floating village. Another small village has sprung up where the boats leave. The huts are a little larger, but still as ramshackle, as those before. We watched fishermen unload their catch, and carry it to huts. The rivershore there is flat and very filthy, and a heavy fish stench was in the air. People were carrying baskets and sacks between the boats and the huts. It was cleaner where the buses stop, and there is the inevitable tourist market selling water, soft drinks, and small souvenirs. The boats are colorful small wooden boats carrying some ten to thirty people. They have a powerful, often open motor in the back, that drives a screw at the end of a long pole, churning the yellow-brown water. We were the only passengers on our boat. There was also the pilot operating the makeshift controls built from concrete reinforcement rods and bicycle components, and a small child who took care of ropes and pushing the boat away from the pier when we left. They must grow up fast here. As we were following the river towards the Tonle Sap lake, we saw many fishermen who had moored their small boats on the shore, and were wading in the river to spread their nets. The picture on the right above shows one. Soon the river widened, and the first floating houses appeared. They are basically wooden rafts that are completely covered with those bamboo-and-palm leaf huts. Sometimes there were several lashed together. Others were built from wooden planks. The school buildings were anchored at the shore, and built from solid gaily painted wood. They even had an anchored basket ball court. Good to see that at least some money was spent well here. 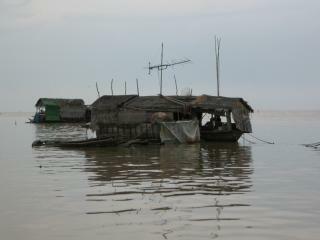 The floating village itself consists of many such raft-houses, floating at some distance to each other. Some of them were shops, small fisheries, and a police station. 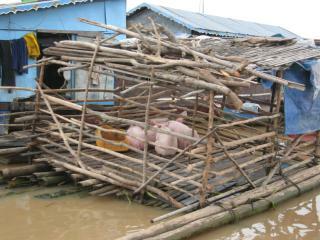 we even saw one that had a small floating cage with two pigs lashed to it. Our boat stopped at a larger collection of solid wooden rafts lashed together to a fairly large structure. It even had two decks to climb up to to get a better view. They had the inevitable souvenir booths, a small sea life museum, and display pools with fish and several crocodiles. You can watch them when they are fed; the large fish tank becomes a foaming mass of hungry fish. Stand back or you'll get wet. The boat tour lasts about two hours, plus half an hour each way for the ride from Siem Reap. 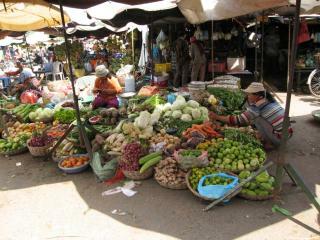 The total cost is about $20, an excellent deal for this insight into rural Cambodia. When walking through a Cambodian town, one sees many amputees begging for money. Cambodia went through several wars in succession. For over 20 years, between 1970 and 1990, Cambodians faced armies that cared only about killing as many people as they could: their own military under General Lon Nol, who fought against rebels and declared any citizen in a rebel-held area an enemy; then Pol Pot's Red Khmer who tried to introduce a kind of stone-age rural communism and left a million people dead who didn't fit into this plan; and of course the USA, who started a mad crusade to kill anything that moves in what they called "freedom deal zones". Whenever the USA declare that they'll bring freedom and democracy, lots of people die. The USA actually supported a blood-soaked Red Khmer coalition against the Vietnamese liberators, who were communists but eventually put an end to the Red Khmer genocide! In the process, the country was exhaustively mined, and even today people die from the countless forgotten land mines still waiting in the ground. Airfare to Bangkok is over $200 including tax, one way, per person. That's a little steep, and I hadn't come to Cambodia to watch it from high altitude anyway. So we got a bus to Poipet, the nearest border town to Thailand. The VIP buses were sold out so we got a cheaper bus for $5 each. It was totally decrepit; the doors were rattling in their frames, many pieces such as lights had fallen off, the entire dashboard was dead, and the seats were painfully worn out. At least I couldn't see the road through large rusty holes in the floor like on that bus in Yucatan two years ago. The road from Phnom Penh to Siem Reap was well-paved and smooth. The road to Poipet is a cratered Martian landscape for the first hour, and then becomes worse as it turns into a dirt road almost all the way. The driver avoided the largest potholes and gravel holes, but it was a very bumpy ride. And loud, because of speeds of 50-60 km/h. No wonder the bus was falling apart. Everything was soon covered with orange-brown dust. We went very slowly over the bridges, the kind where the tires must remain on the narrow logs in the middle that can carry the weight. The bus stopped twice for food, but there wasn't much to see. I watched the other vehicles on the road. I learned that it is possible to carry three grown pigs on the back seat of a motorcycle, back down and feet sticking up in the air. If there weren't dead when looading, they sure were now after riding on this road. Other motorcycles were carrying live pigs in cylindrical wicker baskets. One pick-up truck was so overloaded with people that one guy was sitting on the hood, at high speed. Tell me if you found this information interesting or useful, or if you have comments.